Monday 29th January was a very fishy day. After Sheila had told us about the history of the Barking fishing fleet, Ian talked about two venerable institutions involved with the selling of fish, Billingsgate Market and the Worshipful Company of Fishmongers. Billingsgate is a ward in the City of London just east of London Bridge. A dock was dug there around the 9th century and a market grew up around it in the Middle Ages. Originally it was a general market, but from the 16th century it increasingly specialised in fish. By Act of Parliament in 1698, it was confirmed as a fish market, run by the City Corporation, where anyone could buy any sort of fish. There must have been some sort of cover from an early stage for this all-weather operation, but the early history of the market buildings is not well documented. In 1850, a building in Italianate style was constructed to the design of the City Architect, J B Bunning. It soon proved too small for the growing trade and in 1877 a new and very beautiful building, designed by a new City Architect, Sir Horace Jones, was opened by the Lord Mayor, with three times the sales area of its predecessor. Having such a busy market in the centre of the City was not entirely popular. The surrounding streets were often grid-locked and the stench was legendary. Pressure grew for a new fish market, led by Robert Hewett of the Short Blue Fleet at Barking. In 1882, he secured an Act of Parliament to use a site at Shadwell, but the market there never prospered. In 1899, the Hewetts sold it to the City Corporation. It struggled on until 1914, after which the site became a public park. 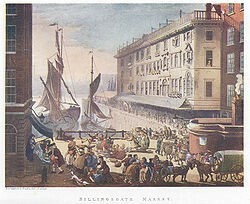 Billingsgate continued on its City site until 1982, when it moved to its present site in Poplar. The building in the City became an events and conference centre. The freehold of the new site is held by the London Borough of Tower Hamlets. The City Corporation, who still run the market, pay an annual ground rent of one fish. 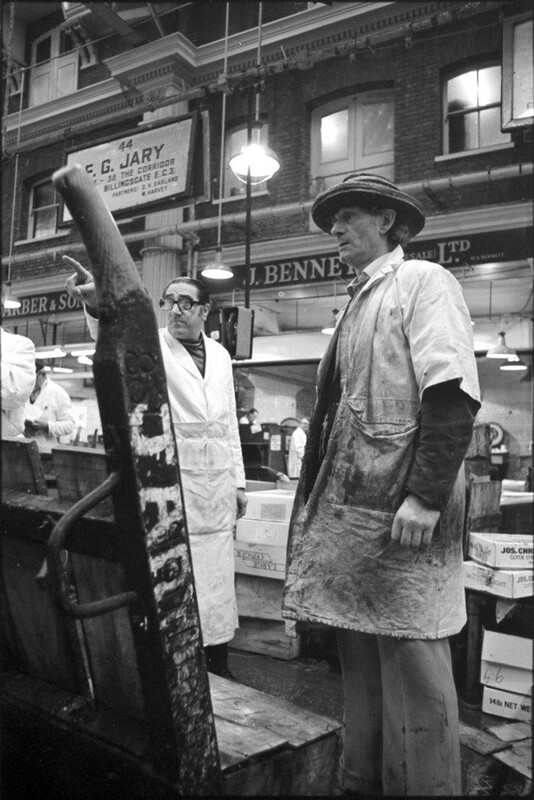 True to the Act of 1698, anyone can still buy fish at Billingsgate, as long as they go during the trading hours of 4.00am to 8.00am, Tuesday to Saturday. The main trade is of course wholesale, with up to 150 varieties of fish on offer, annual sales of 25,000 tonnes and a turnover in the region of £200 million. Billingsgate has its own constabulary, with police uniforms and a police car, though its role is now primarily to provide security and an emergency medical service. The famous Billingsgate porters, with their flat-topped leather hats, were abolished in 2012. The retail fish trade is changing. The National Federation of Fishmongers, which had 9,000 members 75 years ago, was down to 1,300 by 2005, with a 13% share of the market. The other 87% had been taken by the supermarkets, up from 10% in 1982. The trend is doubtless set to continue. The Worshipful Company of Fishmongers, like Billingsgate Market, goes back to the Middle Ages. It got its first charter from Edward I in 1272, but will have existed as a guild of City fish merchants some time before that. Successful guilds were given charters and became livery companies, with responsibility for training and regulation of their trades. By a ruling of the City Aldermen in 1515, the Fishmongers’ Company ranks 4th of the 48 livery companies then in existence. Today the number of companies has grown to 110 and new ones are still being created. Some of the companies own splendid halls in the City. Three prominent fish merchants, all of whom served as Lord Mayor, built a great hall on land to the west of London Bridge, which they gave to the Fishmongers’ Company in 1444. It stood until the Great Fire in 1666, and its successor until 1828. Part of the site was then required for the new London Bridge and the hall was in need of repair anyway, so a replacement was built a little to the west. Serious damage in the Blitz has been repaired and this third hall still serves the Company today. Membership of the livery companies is not granted lightly. The main route used to be by apprenticeship. A young man would serve a member of the company for a period, usually seven years, learning the trade. At the end, he would be “granted his freedom” and become a member himself. The apprenticeship route is now rare and not used by the Fishmongers. There are three other routes to membership: patrimony, redemption and invitation. Membership by patrimony is open to those who had a parent who was a member at the time of their birth. Redemption involves a fee, and is only granted to those with a close link to the company. Invitation is a great honour: the Fishmongers admit one person by that route each year. Their total membership is around 800. 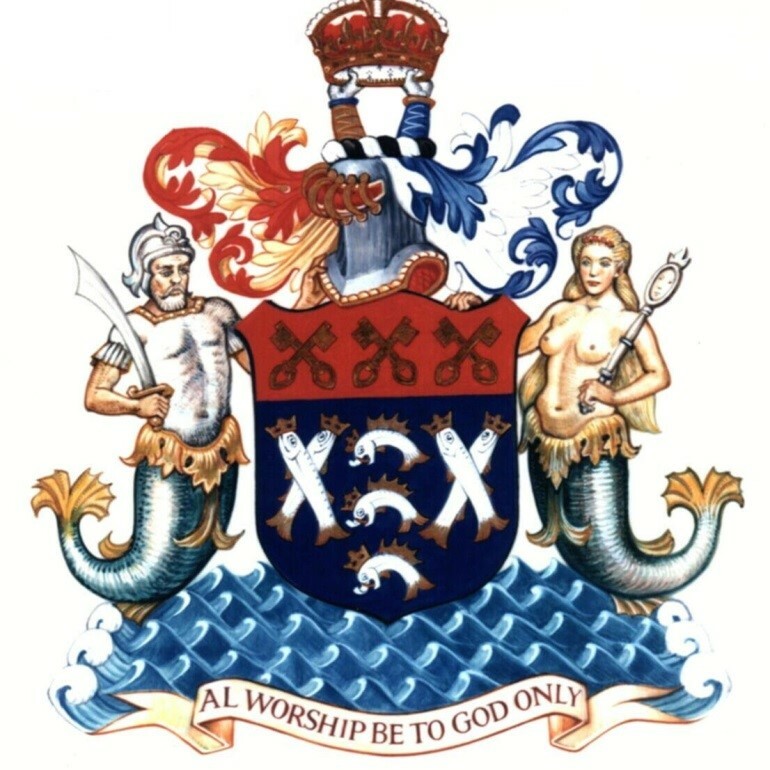 Many of the livery companies have little connection today with their original trades, but the Fishmongers are still very much involved. James I granted the Company a charter in 1604, appointing them as inspectors of all fish sold in the City and in Southwark. The area of their jurisdiction was extended when Billingsgate Market moved to Poplar, and a team of the Company’s inspectors still operates in the market every day. The Company also administers the Master Fishmonger Standard, an accreditation scheme for practising fishmongers. In 1998, it helped to set up the Billingsgate Seafood Training School, which lives above the market. It teaches fishmongering skills, promotes the health benefits of seafood to the public and offers free teaching to children about fish in the diet. The Company also grant aids three other industry organisations: the Marine Biological Association, the Shellfish Association of Great Britain and Salmon and Trout Conservation UK. The Company’s charitable work extends beyond the world of fish. In 1970, several livery companies including the Fishmongers helped the City and Guilds of London Art School in Kennington to reinvent itself as an independent charity. The Company continues to provide financial support and has a member on the board. The largest recipient of the Company’s charitable funding and governance is Gresham’s School at Holt, set up in 1555 by Sir John Gresham, a leading London merchant. The Company took over support of the school when Sir John died the next year and has continued it ever since. It also provides the Elizabeth Garrett Anderson Scholarships for women studying at the University of London Medical School. Anderson, the first woman to qualify as a doctor in Britain, set up a forerunner of the Medical School and her son and grandson, both leading members of the Fishmongers, endowed the scholarships. The final role of the Company which we heard about took us back if not to fish at least to the river. In 1715, Thomas Doggett, manager of the Haymarket and Drury Lane theatres, started what came to be known as Doggett’s Coat and Badge Race, in tribute to George I whose reign began the previous year. Six young men who had just completed their apprenticeships and become members of the Company of Watermen and Lightermen were invited to row from London Bridge to Chelsea, for a prize consisting of a scarlet coat with a metal badge on the sleeve. Doggett continued to organise the race each year until his death in 1721. The Fishmongers agreed to take it over and still run it today. There are still apprentice watermen and each year those gaining their freedom still get their chance to compete over the same course. This entry was posted in All, Presentation summaries on January 29, 2018 by Andie. Surprisingly for much of the eighteenth and nineteenth centuries Barking was the most important fishing port in England. Back in the 1860’s in Barking ‘there were six sail makers, five mast, pump and block makers, five shipwrights and boat builders and four rope and line makers…. four marine store dealers, four slopsellers and two ships chandlers, as well as makers of specialized products such as ship’s biscuit, sea boots, kegs, casks and nets. The stores were supplied with sou’westers, oilskins, big-boots, guernseys, red caps, hawsers, ropes and twine.”’ (Richard Tames “Barking Past) It had become the largest fishing fleet in Britain and possibly the world! Fishing in the River Roding for local consumption is mentioned in documents from the 10th century. [Barking Abbey, which had Royal patronage, was one of the most important in the country and was rich, so the nuns and tenants of the abbey were important customers. Salt-water fishing in the Thames estuary was mentioned as early as 1320 when Barking’s fishermen were prosecuted for using nets with too small a mesh. 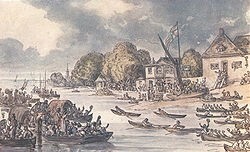 At the time the fishing would have been quite small scale as it was from many other Thames-side locations. By 1814 the fleet had grown to 70 smacks. Following the end of the Napoleonic Wars, with the return of men from the fighting, by 1833 the fleet had grown to 120; by 1845 approximately 150 and by 1850 at least 220. In the first half of the 19th century when the population of London more than doubled there was huge demand for fish. Increasing restrictions on fishing in the Thames encouraged the move out into the North Sea. The growth of the Barking fleet was the work of one family, the Hewetts. In the mid 1790’s, Scrymgeour Hewett (1765-1840? ), a Scotsman from Fifeshire came to London. His father, who must have been fairly well off, had died and his mother brought the family to London. In 1795 he married Sarah Whennel, daughter of James Whennel, who owned 2 fishing smacks. Scrymgeour worked for his father-in-law and was left the boats when James died. He was a good businessman and increased the number of boats which fished as part of the Barking fleet. Scrymgeour’s second son Samuel was destined to become a banker like his elder brother, but he obviously had other ideas and ran away to sea while his father was away at the Napoleonic Wars, where he was an officially sanctioned privateer. On his father’s return Samuel at the age of 14 was apprenticed to a fisherman, becoming a captain at 21. In 1815 Scrymgeour retired and handed over the fleet to Samuel. By 1833 the Hewett fleet, known as the Short Blue Fleet after the small blue square on their flag, consisted of 10 vessels. In Barking as a whole the fleet now consisted of 30-40 smacks, and by 1839 there were 133. Fishing in the winter was mostly trawling. In summer it was line fishing which generally produced fish in better condition. The vessels were “well smacks” which had been developed in the early 1700s. Each vessel was equipped with a large well of water within it, in which the fish could be kept alive. Typically on each voyage the men would fish 3 times. The first 2 catches were gutted and salted on board and taken to be sold in the towns of Western Scotland or the Orkneys and Shetlands. The 3rd catch was kept alive in the well and taken back to London. The men were away from home for around 6 weeks each voyage. Samuel realised that the system was uneconomic. Often the fish was not in good condition by the time it was brought back. His great innovation was the use of ICE. Instead of wet-salting the fish were packed in boxes of ice. Samuel also changed the rounded wicker baskets, called peds, for boxes which allowed more to be packed in. Fast boats, called carriers or cutters, regularly collected the boxes and took them back to market in London. The carriers would then call in to pick up stores, water and ice before heading back out again. A carrier left the fishing fleet every day bound for London. Each carrier packed about 500 boxes, around 40 tons of fish. The smacks now about 50 tons and 75 ft long, carried a crew of 8-10, half being apprentices who were generally orphans from the workhouses. The fishing smacks stayed out at sea continuously for 3 to 6 months at a time. They fished Dogger Bank and the coasts of Holland, Germany and Denmark as well as Iceland. Fishermen from ports such as Brixham and Hull also joined the fleet. 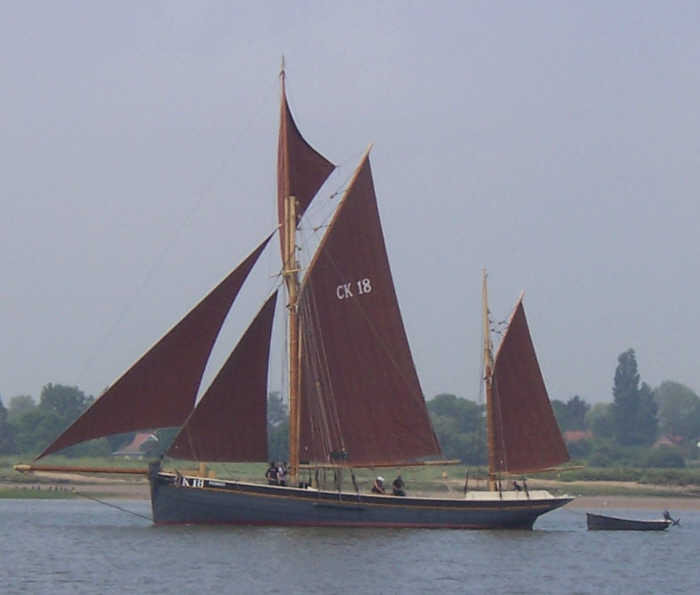 Single smack owners also sailed with Hewett’s fleet and shared in the profits. This “fleeting” system was very successful and the Short Blue fleet had increased to around 50 in 1844 – which was when Hewett’s men went on strike, complaining about being away from home and their families for so long. The fleet was now one of the largest in the world. So how did they get the ice? Ice from Norway was available but expensive. Samuel’s great idea was to flood the marshes near Barking using sluice gates. The area was already prone to flooding and this system was well known in China. “Watchers” were employed to ensure the ice was not damaged by skaters. The ice which formed in the winter was then collected by the local residents on a great social occasion known as the Ice Harvest. A large icehouse was built at Town Quay to store the ice ready for warmer weather. There were other ice-houses too, generally brick above-ground structures. Farmers also began to flood their fields and sold the ice for profit. Samuel’s ideas transformed the fishing industry. By the early 1860s almost every Barking family was involved in the fishing industry, either as fishermen or as makers or suppliers of goods for the industry. 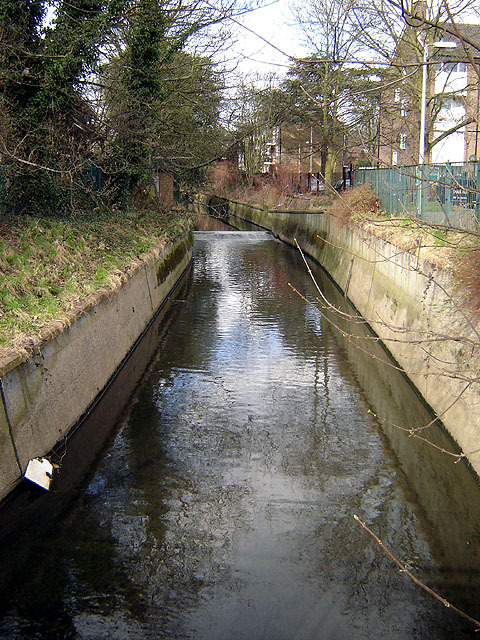 The pool at Barking formed a natural dry dock at the mouth of the River Roding, which enabled repairs and scrubbing to take place there at low tide. The fleet had increased to around 200. By now the population of London had increased to 2 million and demand for fish was exceeding supply. But the downfall of Barking as a major fishing fleet was coming. Others followed Samuel’s ideas and set up their own icehouses elsewhere. Ports such as Grimsby, which had opened its no 1 Fish Dock in 1856 were taking over Barking’s trade. The new railway ensured that the catches could be transported quickly from these East coast ports to the London markets. 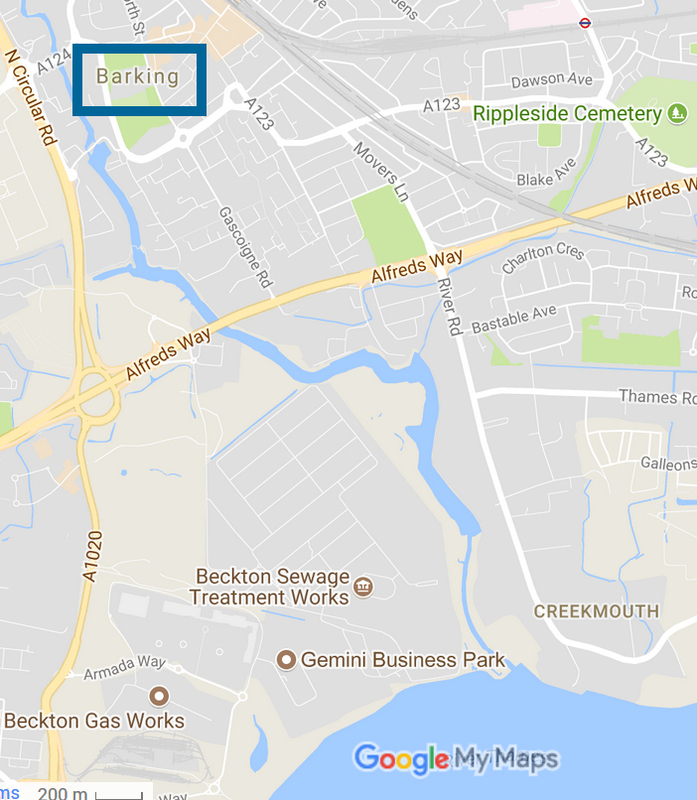 In 1863 Barking was struck a blow by the Great Storm in the North Sea which killed 60 of its fishermen and apprentice boys, and shortly afterwards the Short Blue Fleet was itself transferred to Gorleston, near Gt Yarmouth. By now Samuel had handed over control of the fleet to his son Robert. Robert tried out various new schemes and introduced steam trawlers. He also opened a new fish market at Shadwell to compete with Billingsgate but this venture failed. The end of the fishing fleet in Barking had serious consequences for the local workforce, many of whom worked as sailmakers, ropemakers, chandlers, slop sellers and shipwrights. However new industries, including a large jute factory which opened in 1882, began moving into the area. Many factories, often of the more noxious variety, were springing up along the banks of the River Thames. The Short Blue fleet continued in existence until 1980. An engineering plant for the fleet remained at Barking, but a major boiler explosion occurred in 1899 and the works were gutted. 10 workers died. It was a major financial blow. 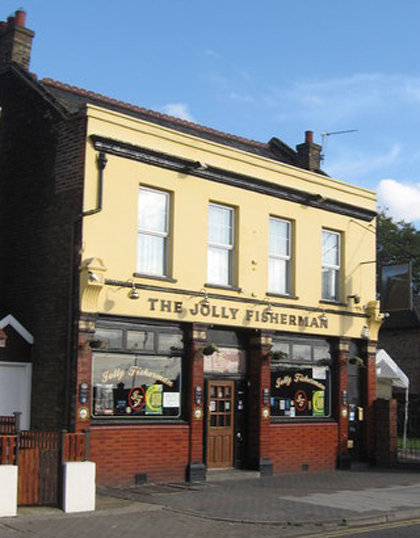 Some traces of Barking’s fishing history still remain or have been commemorated in pub and street names – The Jolly Fisherman pub, Whiting Avenue, Fisher Road which is now Abbey Road, Fresh Wharf Quay- and there are some newer decorative features such as the steel sculpture “The Catch”. These days the ice house and nearby buildings are used as art and cultural centres, and the area is known as the Ice House Quarter. On Monday 15th January, we heard about the history of Trinity Buoy Wharf, which sits at the end of the Orchard Peninsula, where Bow Creek joins the Thames. The name of the peninsula comes from Orchard House, a substantial moated property, latterly a pub, which stood there until about 1870. The site of the wharf belonged to the house and was once a real orchard. In the 19th century, the peninsula became increasingly industrialised. Housing also grew up for the workers, but the two rivers and the East India Docks to the west made it a very isolated area to live. The housing disappeared in a slum clearance scheme in the 1930s and more industry took its place. The industry in its turn has now largely gone and an enormous development of smart high-rise housing is under way. Through all this, the wharf has continued in its little corner of the peninsula. Trinity House, the lighthouse authority for England and Wales, acquired the site in 1803 as a place to store and work on their buoys and seamarks. 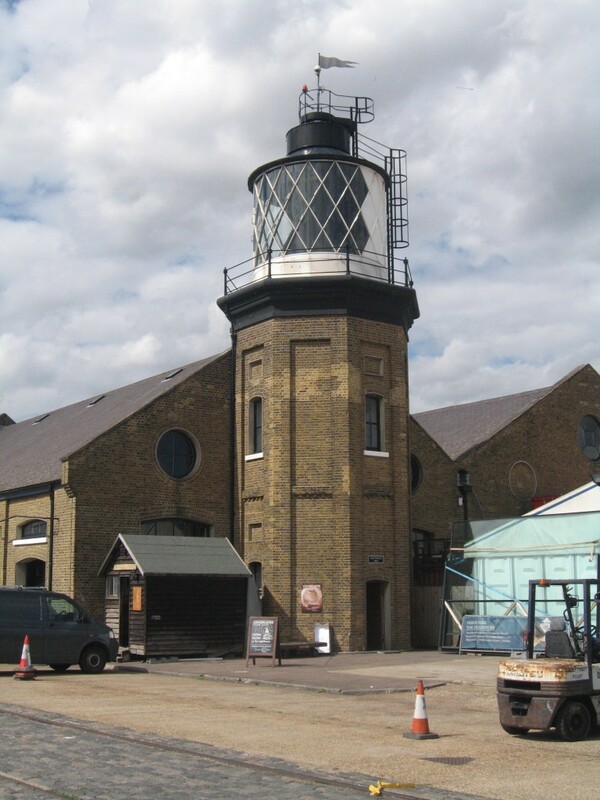 Several of their 19th century buildings survive, including London’s only lighthouse. Built in 1864, it was used to train lighthouse keepers and test maritime lighting. The famous scientist Michael Faraday was scientific adviser to Trinity House and had a workshop next to the lighthouse. The wharf became increasingly busy and by 1910 was employing 150 men. They comprised engineers, platers, riveters, pattern makers, a blacksmith, tinsmiths, carpenters, painters, chain testers and general labourers. Trinity House continued to operate there through much of the 20th century. Following war damage, the 1950s and 1960s saw a significant programme of rebuilding and modernisation. 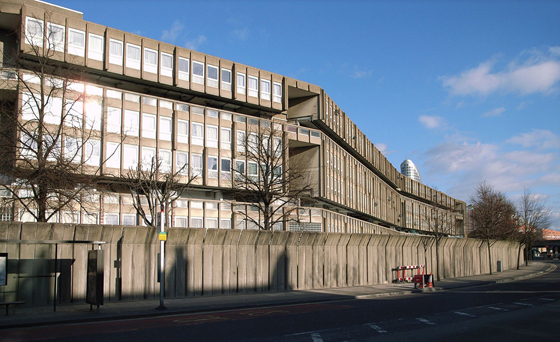 In 1988, Trinity House moved their work elsewhere and sold the site to the London Docklands Development Corporation. Ten years later, a long lease was taken by Urban Space Management, a firm with a track record in finding new uses for redundant urban sites. Since then, a wide range of sympathetic uses has been found for many of the old buildings. These include the Royal Drawing School’s foundation year course, the costume department of English National Opera, a physical training academy, artists’ studios and a prep school. The lighthouse is now home to a musical composition designed to run continuously and without repetition throughout the third millennium. The wharf is also now home to several modern buildings innovatively constructed from converted shipping containers. They offer a mix of housing, office space and studios. The wharf is a very successful mix of old and new. It is freely open to the public in daytime and is well worth a visit. There are an American-style diner and usually (though it is currently vacant) a more general café to reward the effort of getting to this still remote corner of east London. This entry was posted in All, Presentation summaries on January 16, 2018 by Andie. 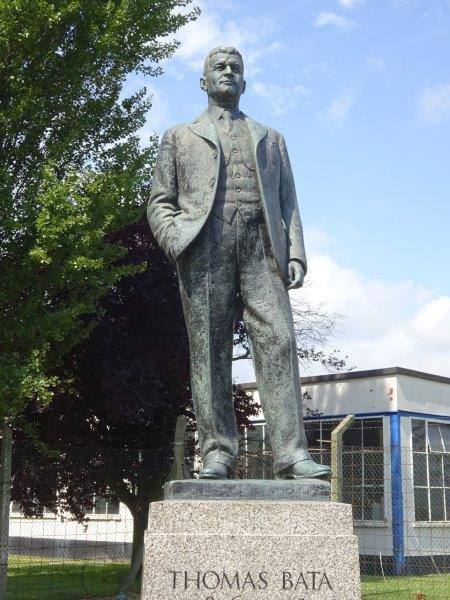 Bata shoes was founded by Tomas Bata (1876-1932) in 1894 in Zlin in what was then Moravia- now Czech Republic. There was a long family history of shoemaking enduring 8 generations, or 300 years. By the 1920s and 30s Zlin had become a modernist factory town, a state of the art “workers utopia” with housing as well as factories. Bata believed that a happy workforce leads to higher productivity. His vision was to create low-cost footwear for the general public. “Everyone has the right to an affordable pair of shoes on their feet”. British Garden Cities such as Letchworth influenced the grid layout of the town, with its open feel, but the architecture was more in the Bauhaus style, Modernist and Functionalist. It was designed by some of the best architects who had worked with Le Corbusier and Frank Lloyd Wright and predated the renowned Isokon flats and Lubetkin’s Highpoint in London. The 16 storey headquarters 21 Building was then the tallest building in Europe (allegedly!) The Bata shoe store in Prague which dates from the 1920s is described as iconic and is still there. Tomas Bata visited the US and in 1904 worked on an assembly line there. He visited again in the interwar years. His trips to the U.S. and Ford’s factories inspired him to establish assembly line methods of production in Zlin and worldwide. 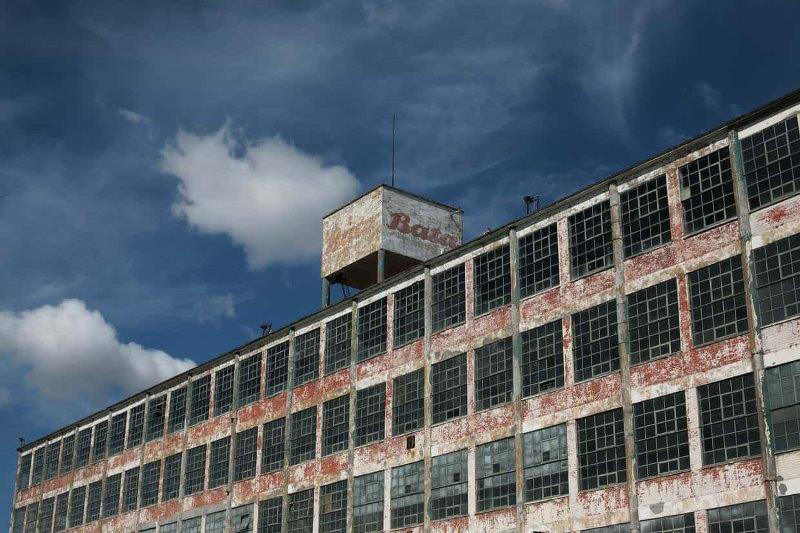 Factories and Bata towns were established in the US, Canada, India, France, the Netherlands, Brazil etc. However the business was decentralised and allowed for design appropriate to local demand. 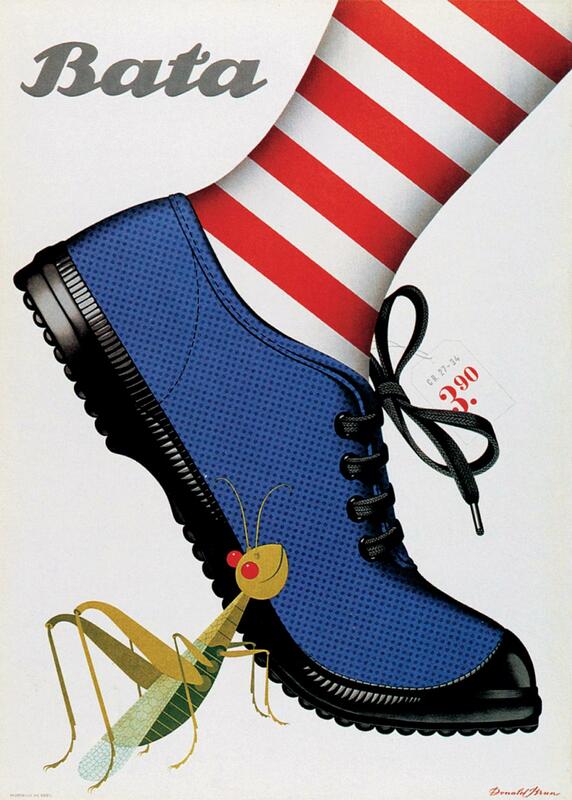 By the early 30s Bata and Czechoslovakia were the world’s leading footwear exporters. On Tomas’s death in 1932 his half-brother Jan and later his son Thomas took over the now worldwide Bata Shoe Organization. Jan had his office in the HQ 21 building in a giant elevator so he could monitor the whole operation without leaving his desk! The son Thomas is credited with starting the idea of 99 pricing (eg £19.99)… By the start of World War II Zlin was a town of 45,000 inhabitants. In the 1930’s the threat from Hitler was growing in Czechoslovakia. Bata had already established factories in many parts of the globe and when a local clergyman sent a plea to Bata to come and establish a factory at Tilbury to provide work for local people, badly hit by the Depression, Tomas Bata saw the opportunity for some of his Czech workers to come to Britain. The site was attractive – close to sea ports and London and the rural site offered a better quality of life. Tomas Bata was killed in a plane crash in July 1932, but the site had been purchased and the project continued according to instructions left by him. In 1933 the first “Bata Houses” were built for the workers at Tilbury. The cubic, modernist house or “Boxes for shoe people,” all straight lines, right angles and boxy shapes, were quite unlike the red-brick houses of the London suburbs and took people a while to get used to. The first houses were built on an open plan, but later, bowing to local taste, included a “best front room”. All had bathrooms and electricity, not always to be taken for granted in that area. The houses were generally much appreciated. There was a hostel for single people. In 1939 Jan Tusa (father of John Tusa of the BBC World Service) was sent from Zlin. He was a 30 year old accountant and soon he was to take over at Tilbury. Tusa’s family, including John who was born in Zlin, soon followed him over. Second World War contracts helped British Bata to thrive, and 30-40 Czech managers were sent over to train the local English workforce, though the language barrier was sometimes a problem. During the war when many of the men were called up the women took over their jobs. At least 81 employees were killed. After the war Bata in E. Europe, which had been taken over to produce footwear for the Nazi regime, was nationalised by the communists. Bata HQ moved to Toronto, Canada. The style of management was “very robust” as John Tusa has described it, but effective. Competition between departments was required – weekly league tables were published in the Bata Record, and there was a Christmas quality competition. The company’s modern methods included objective setting, management by performance, brand image and a mission statement. Jan Tusa as MD spent a day a week walking round the factory. Mistakes were not treated kindly. The MD’s response was described as “playing hell”! Life at Bataville for the workers was reportedly a cross between a holiday camp and a prison camp! The town was designed to meet all their social needs. There was a theatre, sports facilities (West Ham football club trained on the football field and played the Bataville team once a year! ), a hotel, a cinema, a restaurant, grocery and butcher’s shops, a post office and the town’s own newspaper, the Bata Record. In 1963 an Espresso Bar with a coffee machine and a jukebox was added and some well-known pop groups visited. Tom Jones played in the hotel ballroom. A company farm supplied milk, eggs etc and workers were encouraged to volunteer there in their spare time. There were regular dances, parties, concerts and sports days which everyone was expected to attend. Teamwork and a sense of solidarity were encouraged. Czech music, songs and country dances were much in evidence. Marching music was played over loud speakers as the workers entered the factory. Gardens must be kept tidy or disciplinary action would be taken. No bad behaviour was tolerated but was not usually a problem as the residents took pride in the company and their town. However to some residents the all-embracing company town was stifling. And if you lost your job you lost your house. At its peak there were 3000 workers at East Tilbury. So what happened to Bataville? In 1970s conditions for trade changed and manufacturing began to be shifted abroad to places where footwear could be produced more cheaply, such as Malaysia and India. No shoemaking takes place at Zlin either now. 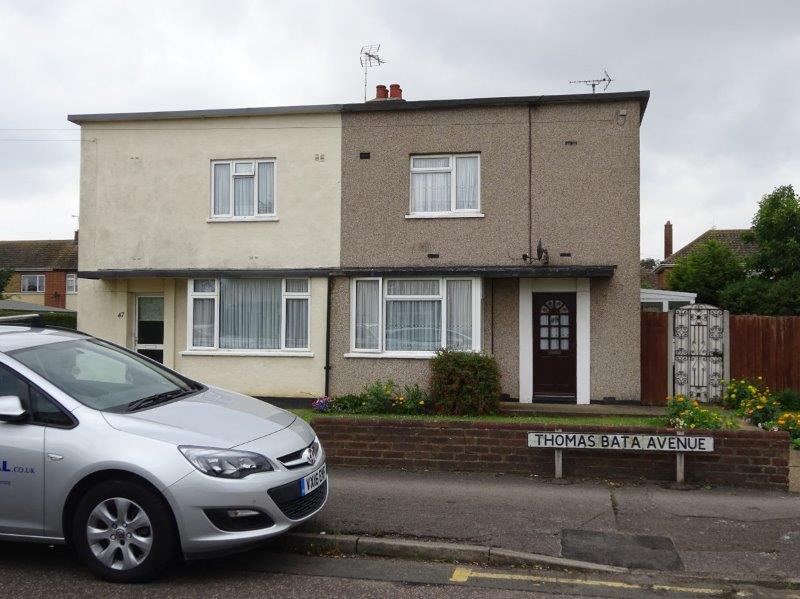 Downsizing took place at East Tilbury in the 80s, and closure finally came in 2005. The disadvantages of the “company town” now became evident as unemployment hit and buildings fell into disuse. In 1993 the unique quality of the town of Bataville was recognised and it was made a Conservation Area, including a Grade II listed factory building. However the leases of the buildings had been sold off and as people died or moved away the houses came into private hands. Facilities such as the swimming pool closed or changed use. The listed factory building is now owned and used by a storage company. The library became the Bata Heritage Centre, unfortunately burned down by vandals earlier this year so I was not able to visit. (Hopefully to be restored). Under the Thames Gateway plan (2006) the whole area is earmarked for mass regeneration. Architects Allies and Morrison and the private company Thamesgate have plans to turn East Tilbury and neighbouring Linton into “a sustainable community-based town re-founded on local needs” with 7000 new houses and 5000 new jobs by 2021. We wait and see. This entry was posted in All, Presentation summaries on December 4, 2017 by Andie. Poplar High Street, running east-west across the top of the Isle of Dogs, is steeped in history. There has been a road in that position at least since the 15th century. It used to be a classic high street and a significant through route. Thanks to a continuing process of development and change, it is now neither. Poplar High St. Courtesy Google Maps. The High Street has played a significant part in the history of the port. It used to be at the heart of one of the dockland communities. In the 17th century, it was the only land route to Blackwall, then a major shipbuilding and repair centre, and to the central part of the Isle of Dogs. The East India Company had property on the street, it was greatly affected by the building of the West India Docks and it was home to the Poplar Workhouse, many of whose inmates had port-related trades. At the turn of the 20th century, the street became home to the London County Council’s School of Marine Engineering. Gascoyne’s map of the area in 1703 and Rocque’s map of 1746 both show the High Street as the only road in the area which was at all built up at that stage. Much of the land was owned by the manors of Poplar and Stepney. 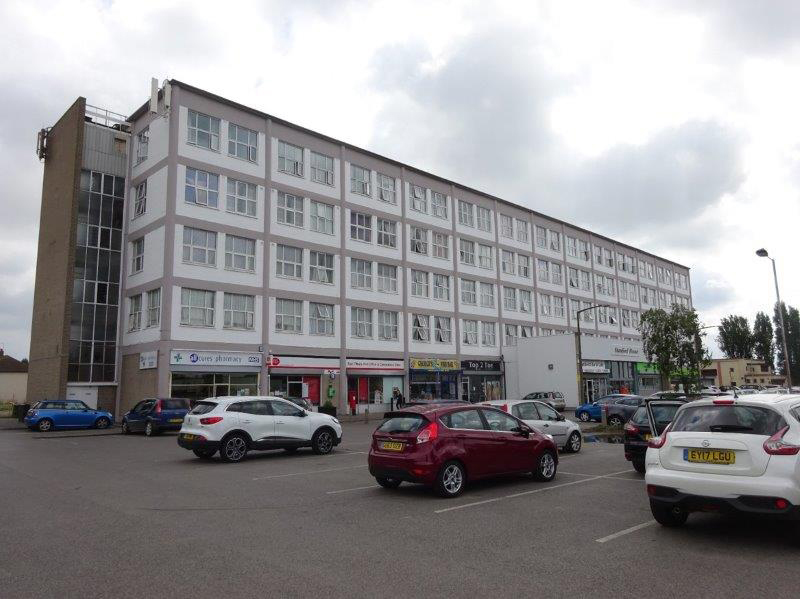 It was mostly leased out in quite small parcels and then further sublet to the actual occupiers. 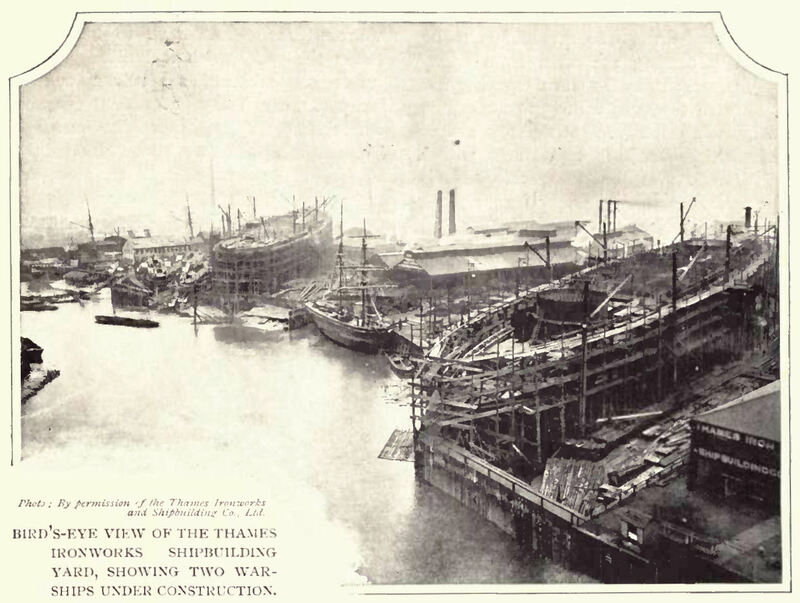 When the East and West India Docks came in the first decade of the 19th century, that was a trigger for a large amount of rebuilding along the street. This is the stage at which it became a typical high street, with most of the new buildings consisting of a shop with residential accommodation behind and above. 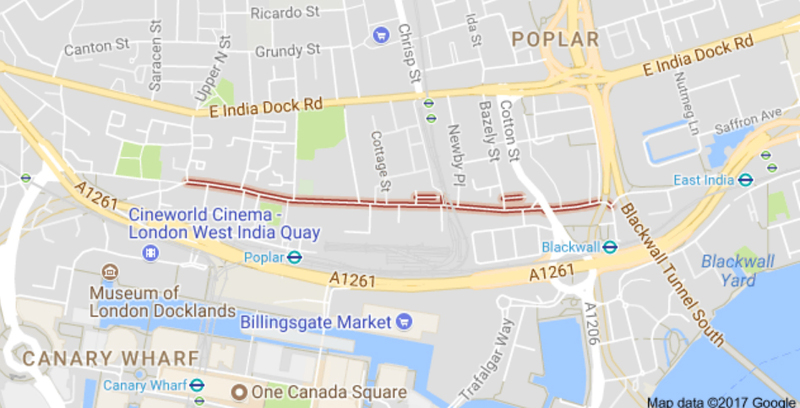 By 1840, the surrounding area had become much more developed, with East India Dock Road built to the north in 1812 and the London and Blackwall Railway newly opened to the south. 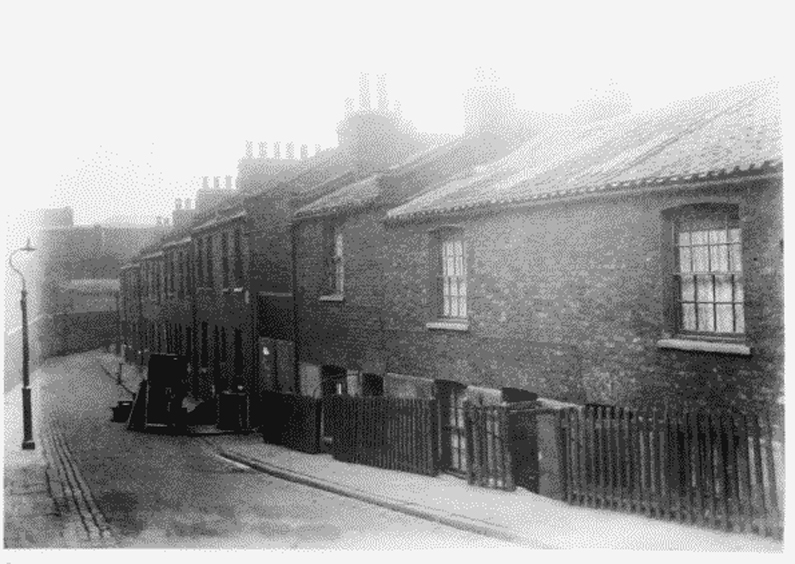 Harrow Lane, at around 1920. Public Domain. The street was now at its most prosperous. The 1881 census shows a well-to-do middle class street, with an average of five people per building and one family in six having at least one live-in servant. Just to the north, however, there were a number of courtyards squeezed in on back land with far less salubrious housing. By the start of the 20th century, the street was becoming very shabby and a number of noisome trades were springing up. Much of the housing was now in poor condition, and in the mid 1930s Poplar Borough Council made a number of slum clearance schemes, replacing old housing with the first of the blocks of council flats which dominate the street today. More followed in the 1950s, replacing houses damaged in the Blitz. Here are some examples of the way land usage along the street developed and changed over time. The East India Company site: In the 1620s, the East India Company was persuaded of the need to provide almshouses for retired seamen and their families. In 1627, they bought and converted a substantial Elizabethan house on the street, with space for a garden behind. Shortly after, they were persuaded to build a chapel in the garden for local worshippers, to save the journey to St Dunstan’s in Stepney. It opened in 1654 and is the only church left in London which was built during the Commonwealth. The Almshouses, at around 1798. Public Domain. In 1801 the Company replaced the original house with a row of purpose-built almshouses along the street and another row at the end of the garden. In the middle of the street frontage was a house for the chaplain who served both the chapel and the almshouses. When the Company folded in 1858, the chapel became a parish church, St Matthias, with the chaplain’s house becoming the vicarage, while the almshouses were demolished. One corner of the site was used to accommodate offices for Poplar Board of Works and the rest was turned into a recreation ground. The church is now a community centre, the offices are a hotel and the vicarage is private flats. West India Dock housing: Dolphin Lane, one of the ancient lanes leading south from the High Street onto the Isle of Dogs, became a short cul-de-sac when the West India Docks were built. The Dock Company built 70 cottages there for its workers in 1849 and later added a library and reading room. The popularity of the latter gradually faded and it closed in 1886. The building was put to a variety of industrial uses until the whole site was cleared in 1936. Today, exactly where the cottages stood, are some pleasant rows of slightly cottagey housing, an unusual sight in an area dominated by flats. A similar story can be told of the other ancient southward lane, Harrow Lane, whose post-dock remains contained some indifferent Victorian housing, as well as houses built by the Dock Company for their police force. A slum clearance scheme in the 1930s made way for two elegant blocks of council flats. On the opposite side of the High Street another 1930s block marks the spot where three of the more unpleasant courtyard developments were cleared. From workhouse to college: Poplar Workhouse occupied a row of houses on the south side of the High Street from 1757, and acquired its own purpose-built premises on the site in 1817. The premises gradually expanded behind the main frontage throughout the 19th In 1854, there was accommodation for 601 inmates; this rose to 786 after 1868. The Workhouse, in around 1950. Public Domain. In 1894, a public library was opened on the High Street a little to the east of the workhouse, and shortly after the space in between was used by London County Council to set up a marine engineering college. The workhouse and the library were both badly damaged by bombing in the Blitz. The workhouse closed, though it was not demolished until 1960. There were plans to demolish the library as well and replace it with an extension to the college, which was by now a further education college. In the end, the library building was kept and incorporated into the college. In 2004, a further college extension was built on much of the workhouse site, so what is now New City College occupies three adjoining buildings in very different styles spanning more than a century. On another part of the workhouse site the name The Workhouse has been retained for a modern sports and leisure building. Today the strong residential element in the street remains, together with some of the religious, educational and social features that go with that, but most of the shops have gone. Today Poplar High Street is nothing more than a typical nondescript modern urban street. Maybe, though, two recently opened boutique hotels are a sign of gentrification to come. Robin Hood Gardens. CC BY-SA 2.0. Sourced from Wikipedia. There is one other indication of what may happen in the future. On the north side of the street at the eastern end sits Robin Hood Gardens, two long curving blocks of council flats in a starkly modernist style completed in 1972. These controversial blocks are at least the third wave of housing on the site, and are themselves awaiting demolition. They will be replaced by the second phase of a massive housing development known as Blackwall Reach; the first phase on the south side of the High Street is already well advanced. This is the first development which suggests that what we think of as docklands regeneration is reaching the area. This could be a turning point for the High Street. For much more detail about the history of the street and its buildings, see Volume XLIII of the Survey of London, available online at www.british-history.ac.uk/survey-london/vols43-4 . This entry was posted in All, Presentation summaries on November 27, 2017 by Andie. Pymme’s Brook. By Sue Flockton. Pymme’s Brook, named after William Pymme, a 14th century landowner, through whose land the brook flowed, rises at Beech Hill lake in Monken Hadley, Barnet and joins the river Lea at Tottenham Marshes. From there the flow is to the Thames. In the western area, most of the Brook flows through open ground, while in the east much is now covered – a hidden river. In the course of its route, it is joined by several other streams such as Bounds Green Brook, Moselle Brook and Salmons Brook. Pymme’s Brook at Upper Edmonton. Photograph by Fin Fahey CC BY-SA 2.0. Sourced from Wikipedia. Prior to the dissolution of the monasteries, much of the land belonged to different religious orders, in particular the Abbey of Saint Albans and the nuns of Clerkenwell. There are records of the wood from the area being used to build the abbey at St. Albans, and of there being mills at various points along the stream, suggesting it may have been wider than at present. After the dissolution, much of the land became the possession of Lord Burghley, who already owned a house nearby at Theobalds. He gradually sold or leased much of the land, which led to the building of many large houses, whose estates encompassed the brook. Most were built in the Tudor style, but were later rebuilt in the C18. Most of the great estates have now disappeared, but many of the houses remain, though they are no longer used as family homes. In many cases the local councils bought the land and opened public parks. The first of these reached from the source, was Littlegrove House, in the present East Barnet. Records show that Capabilty Brown worked on the gardens here, though we do not exactly what work he undertook. However, his accounts suggest that it was a substantial amount of work. The house itself has disappeared, though some of the garden walls remain in the gardens of the houses which were built in the area. Oak Hill House became a theological college. The grounds were bought by the local council which opened them as a public park, keeping the woods which remained. These are now a nature reserve, through which a tributary of the brook flows. 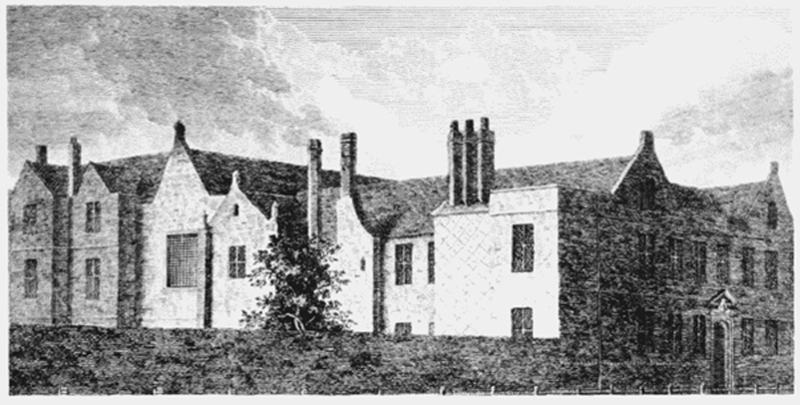 Osidge House came into the possession of the Hadley family (as in Monken Hadley, Hadley Common). In the 19th century it became the home of Thomas Lipton (of tea fame). On his death, the land was sold to the council, but the house was left to become a home for nurses. It later became a care home and, at present, may be turned into flats. From Osidge the brook flows to what is now, New Southgate, bordering the cemetery which was built in the 19th century when the burial grounds in central London were closing. For a few years it had its own Necropolis station, with a branch line from the northern railway and a morgue at King’s Cross. However, unlike similar stations such as the one a Brookwood, it was never a great success – probably because it was not a great distance from the centre. Arno’s Grove. Picture from volume 5 of “A Topographical and Historical Description of London and Middlesex by Messrs Brayley and Brewer Sourced from Wikipedia. Public Domain. Arno’s Park overlooked the stream, in the area now known as Arnos Grove. It was pulled down in the early 18th century and replaced by a house a little further up the hill from the brook. In the 20th century it was the home of the Walker family of brewers, and seven sons who played cricket for England. Nearby was Minchenden House – called after the nuns (Mynchen) of Clerkenwell. When the Walkers wanted to expand their grounds, they bought the house and pulled it down. The house contained wall paintings by Lanscroon. Arnos house was the first in Southgate to have electricity. Eventually, the property was sold. The area around the brook was bought by the council and opened as a public park. This now has a viaduct carrying the Piccadilly Line. The rest of the land was sold for development. The house became the offices of the electricity company, and is now a care home called Southgate Beaumont. Flowing eastwards, the brook became part of the Broomfield estate – again opened as a public park. 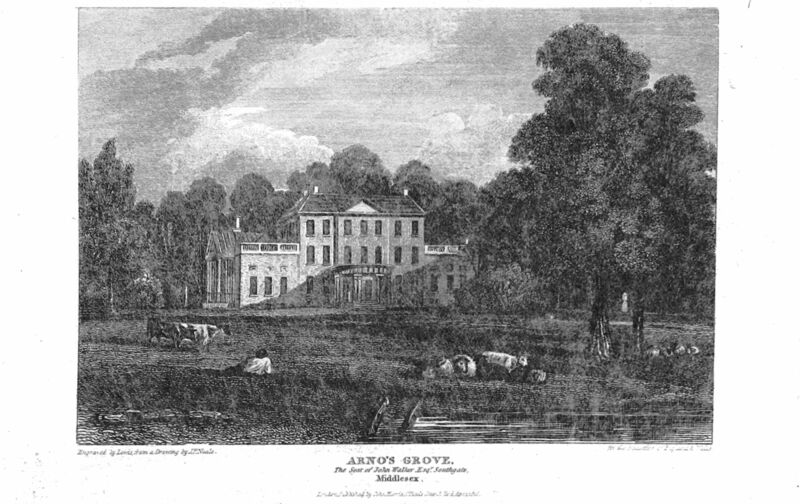 Like Arnos house, Broomfield contained Lanscroon paintings. The house was badly damaged by fire in the 1980s and 1990s, though the basic structure remains and is the subject of much debate about a possible restoration. The grounds still remain as a park and contain lakes believed to have been the monastic fishponds. Flowing back and forth under the North Circular Road, names around the brook reflect its industrial uses. Evidence suggests that Tile Kiln Lane was in an area of tile and brick making, dating back to Roman times, while Tanners Lane reflects the use of the brook for tanning over many centuries. Millfield house – the name suggesting that there was once a mill on the brook here -still stands. After it was no longer a private house, it was sold to the Strand Union Guardians and became a workhouse for orphans. In WW1 it initially housed Belgian refugees, then became an hospital for epileptics. Left empty for many years it was taken over by the council and now houses an arts centre, with a theatre having been built in the grounds. Further into Edmonton, the brook flows through Pymme’s Park. After having had a series of owners including Pymme and Burghley, the estate was bought by the council at the beginning of the C20. The grounds became a public park, but the house was bombed in World War II. Beyond this, the brook is mainly hidden, apart from one or two glimpses in what is now an industrial area. Shortly before reaching the Lea, it is joined by Salmons Brook. It then flows through Tottenham marshes, where it is joined by the Moselle Brook. It then joins the Lea near Tottenham lock. 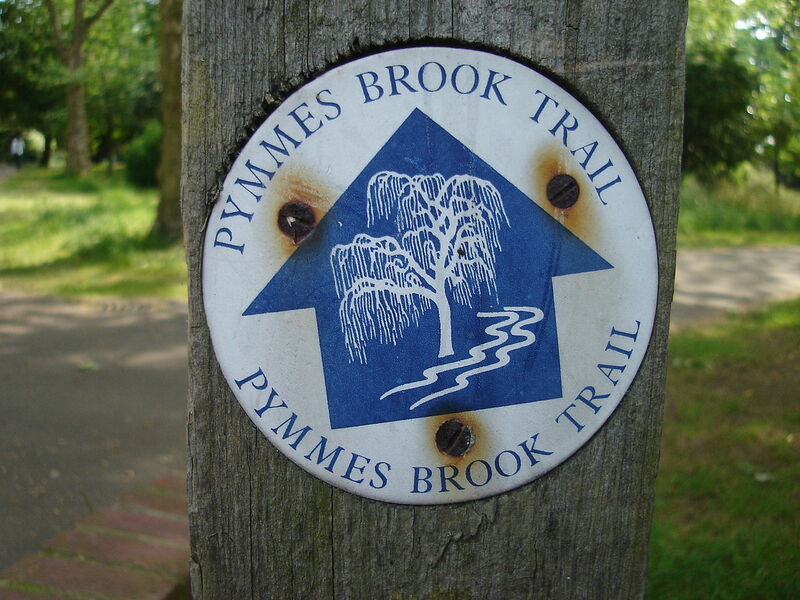 There is a Pymme’s Brook trail from the source, but which from Edmonton, follows Salmons Brook to Picketts lock.